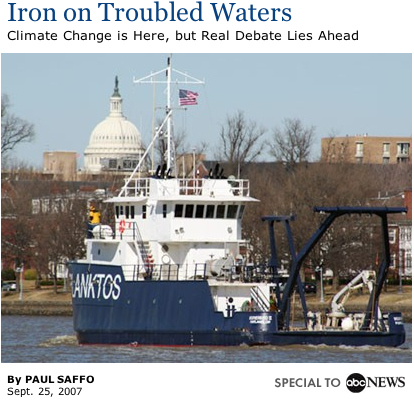 An excellent editorial by Long Now board member Paul Saffo on the Planktos carbon sinking project came out today. It is the first in a monthly series he is writing for ABC News. Saffo does an excellent job in clarifying what has become a characteristic battle in the green tech industry. On one side are “engineers,” people convinced that we must work our way out of the climate crisis by engaging in planet-scale efforts like sequestering carbon, unfurling orbital sunshades, tossing dust high in the atmosphere to block sunlight, or moving wholesale to nuclear power to eliminate coal-based emissions. On the opposite side are individuals — call them “druids”– who are equally convinced that the only sensible option is reduce our human planetary footprint, to conserve, preserve and remediate the threatened natural environment. We have seen this now playing out all over the world where the “druids” have some out against many low-to-no carbon methods of generating power (wind, hydro, nuclear and in some cases solar all fit this bill). What is often missing from these arguments are the larger contexts that now global warming is forcing upon us. We see opposition of wind farms world wide due to ‘unsightliness’ or because they may kill several hundred birds per year (However it is estimated that there are 32,000 air quality related deaths each year in the US, and hundreds of thousands world wide due to coal burning alone). It seems that while we argue over how pretty a wind mill is, the earth’s climate continues to change. And soon the New England beach homes whose views may be adulterated by the windmills will be underwater.